Joe Root toasted England’s Test series victory over India but insisted: We’re yet to hit our peak. 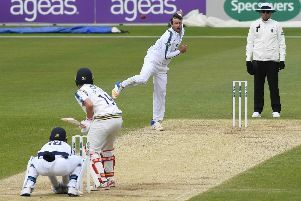 The hosts delivered a 60-run win on the fourth day at the Ageas Bowl and take an insurmountable 3-1 lead into the final match at the Oval. Having been set 245 to win, Moeen Ali again proved the scourge of India with the ball. He finished with match figures of nine for 144, claiming the key wickets of captain Virat Kohli (58) and Ajinkya Rahane (51) as the tourists were all out for 184 in their second innings. The series success against the world’s number one-ranked Test team is Root’s favourite since being appointed captain in February 2017. But he believes his team still have room for improvement. The skipper said: ‘It’s definitely been the most enjoyable. I feel like I’ve had quite a big input in what has been going on and been in control of things. ‘I’ve got a very clear vision long-term as a group and it’s really exciting times for me and this team. ‘The guys are willing to buy into that and are realistic and understanding where we could get to. England were on the back foot during the afternoon session when Kohli and Rahane shared a 101-run partnership. But Root was always confident in his attack. He added: ‘We always knew there was going to be a partnership at some stage and if we could stay calm, collected and stuck to what we wanted to do then the wicket would do the rest.